In 1988, three gray whales were found trapped in ice in Barrow, Alaska, and became a worldwide media sensation. Hundreds of rescuers flocked to the scene, a Soviet icebreaker was sent to provide access, U.S. helicopters assisted and a crush of media stood watch. The U.S. would eventually spend $5 million on the whale-saving effort. That story has now been adapted into the movie Big Miracle, starring Drew Barrymore as a Greenpeace volunteer, John Krasinski as a local news reporter (and that Greenpeace volunteer’s ex-boyfriend) and Kristen Bell as a TV reporter hoping the story will provide her big career break. As a longtime animal rights activist and environmentalist, the movie was a natural fit for Bell, who spoke to E about the film which hits theaters on February 3. 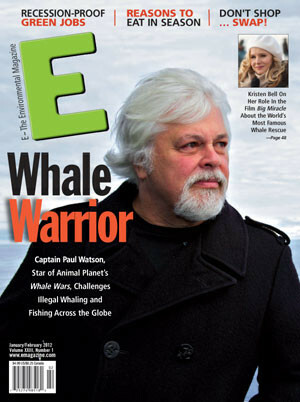 E Magazine: Tell me about the many different interests at play in this whale rescue. Kristen Bell: The story in the book on which the movie was based [Tom Rose’s Freeing the Whales: How the Media Created the World’s Greatest Non-Event] is not very black and white. Everybody’s side of the story is explained: the Soviets, the Americans, Greenpeace, the media. While the U.S. spent $5 million to save the whales, a lot of researchers were making statements that “this is how natural selection works.” And the Inuits had a great point—“If we aren’t allowed to harvest these whales, how are we supposed to feed our babies?” The story is about the filter the media puts on an issue. It’s more complex than it seems. E: The whales in the film look so realistic—did you work with actual whales? K.B. : They’re animatronic whales, and completely controlled. There were three whales and the majority of their bodies were built. They looked amazingly realistic. A special effects team from New Zealand shot on this little barge. I went whale watching in southern Africa and saw southern right whales five feet from the boat and I was re-impressed with how real the whales from the film looked. E: Tell me how the media is depicted through your character, TV reporter Jill Gerard. K.B. : The media is depicted as the frenzy that it can often become, promoting an issue that is sellable. Over 150 journalists traveled to Barrow, Alaska, to cover this story and no one had ever given Barrow, Alaska, a second thought. There were something like 70 different countries represented. It’s exceptional how quickly it all caught on. My character’s perspective in the film is less concerned with the safety of the whales and more about the news story. It’s important to consider how the news is filtered before it gets to the public. In playing Jill, I didn’t intend to demonize her perspective. It’s much more a career move. E: The Greenpeace volunteer played by Drew Barrymore seems very sympathetic. K.B. : I identified far more with Drew’s character than mine. Being an animal lover and an environmentalist, I share that passion. I really identified with the part where she’s underwater and can understand the connectivity of us and animals and the environment. E: Having done this film, do you look at conservation issues from a new perspective? K.B. : I understand why the media wanted to cover it and also the Inuits’ perspective. From their perspective, most people eat tons of meat, what’s the difference? I think to make truly compassionate decisions, it’s important to understand all sides.